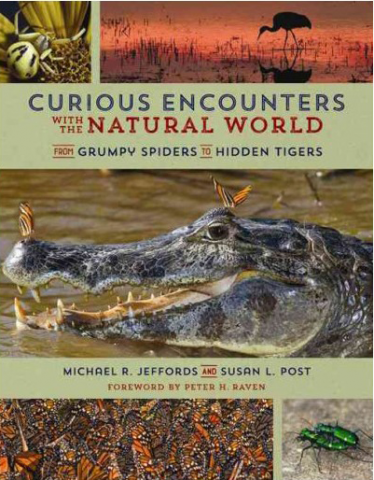 Join us for a celebration of a new book by Michael Jeffords and Susan Post: Curious Encounters with the Natural World: From Grumpy Spiders to Hidden Tigers. The event will include food trucks, cash bar, music, and a book signing. A presentation by the authors will begin at 6:00 pm. Jeffords and Post have circled the globe--and explored their neighborhood--collecting images of the natural world. From the "necking" battles of mate-hungry giraffes to the breathtaking beauty of millions of monarch butterflies at rest, the authors will share stunning photographs and their own insights, taking the audience on a tour of the diverse life inhabiting our planet. This event is sponsored by the Illinois State Museum, Lincoln Memorial Garden, Illinois Audubon, and the Springfield Audubon Society.